Changed the thread title to help those reseaching Martelly bikes in the future. That's a really nice bike - i do have a soft spot for the 90s, so i really love the paintjob! Surprised you got a response from Ribble - I've tried to contact them a couple of times about mine and no response! Well, I waited a few days after the first response from them saying they'd look into it and then emailed again. I got a response back from a manager that day. I did point out in the first email that I was a long time customer. I realize their time is valuable and helping with something like this doesn't really bring them any profit. Yep, I wish I knew why the repaint and ribble decals. If I could tie the bike to racer looking like it does I'd leave it alone but right now I'm thinking about pulling off the decals. Just thought I'd update this a bit. Full on winter still here so I still haven't gotten a ride in on this. But I have done several things to it. I coldset the rear to better handle a modern 130mm wheelset. Then I mounted on an older set of Mavic Kyseriums SL wheels with some Vittoria Open Corsa CX 700 x 25 tires and latex tubes. Then I noticed that the DT shifters were the indexing SL-7402 ones. So I swapped out the 7 speed rear cassette with a new 8 speed 12-26 cassette and chain. Additionally, I swapped out the non compatible RD-6207 derailleur with a matching Dura Ace RD-7402 I had on hand. Took about 5 minutes to setup the new RD and get the indexing working just fine. I also swapped out the saddle with a new Fabric Scoop black saddle with a green underside that matches the darker green color on the bike. 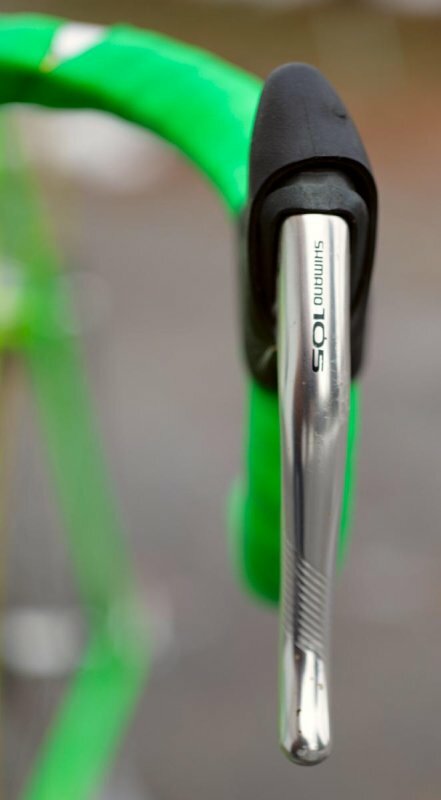 I'm still trying to find a similar color green bar tape as I love how that looks. 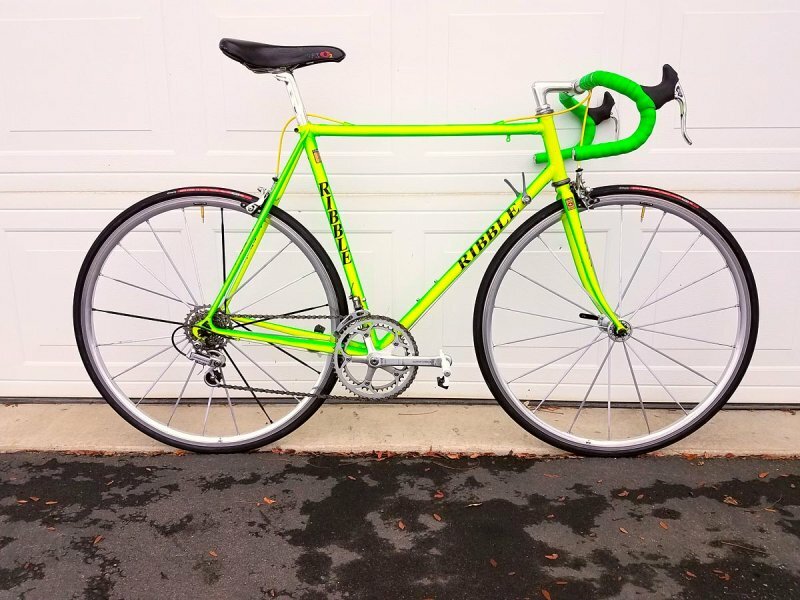 The brakes are setup backwards of what I am used to so I'm hoping to find the right bar tape soon so I can swap those around. 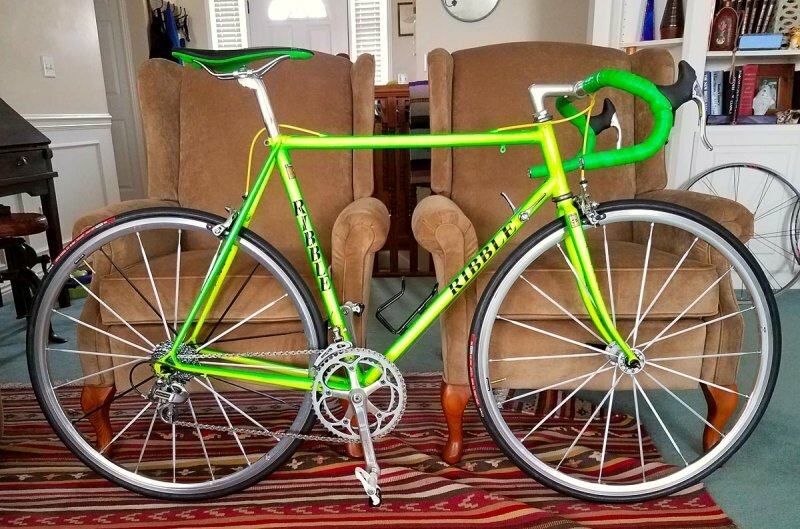 I was considering upgrading this with a new R8000 Ultegra groupset I have but now am considering just upgrading the whole beast to 7400 series Dura Ace. Anyway, a couple of pics. This was shot the other day after some of the work. And then after the changes today. Got another major dump of snow today so still waiting to get the first ride in. The bike now weighs 20 lbs 4 ozs as in the last picture. I like that, just a really nice thing and I agree full DA 7400 will look right on it and I love a DT lever but the brifters will make it more every day usable. 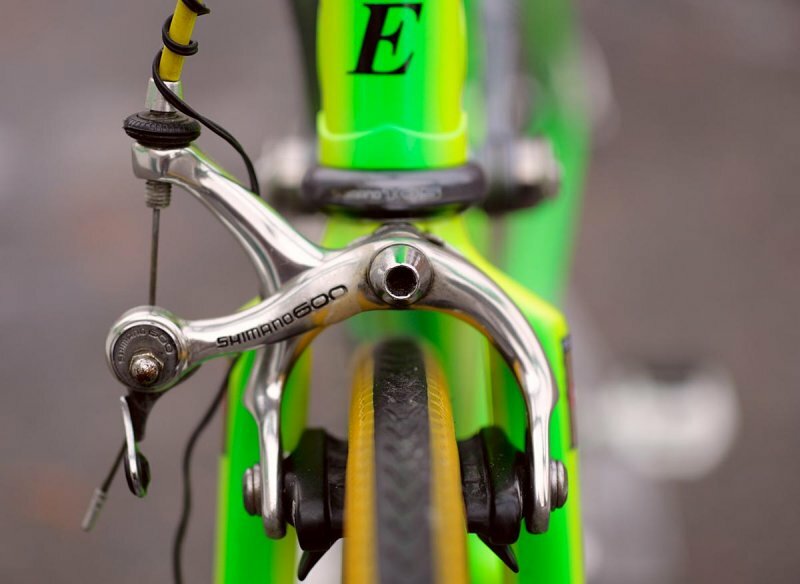 The hardest part of sticking to full Dura Ace is finding economical brake levers. The cost almost drives you to brifters. Or should I say the cost of the hoods. I've got a set without hoods and finding the right hoods is like searching for the holy grail, LOL!